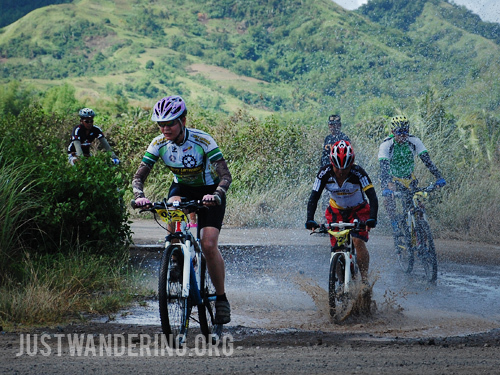 Last April, the nice folks of Pueblo de Panay took us to Roxas, to experience firsthand what the city offers. They timed the visit during the Capiztahan, the province’s annual fiesta. I was supposed to go to Capiz last December, but Toronto happened, so I was very happy that I got another invite to go. What better way to welcome visitors to the Seafood Capital of the Philippines than with a hearty breakfast of shrimp, crab, and fish? We had it at the food court right outside the Teodoro Arcenas Trade Center. It’s similar to a dampa, wherein you pick your seafood and have them cook it to your liking. You can actually take home some seafood, though you’d have to pack them in Styrofoam ice chests to keep them fresh. The market opens at 5am, which gives you just enough time to buy and make it to your 7am flight back to Manila. 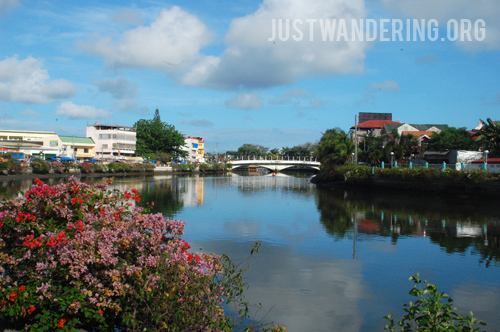 I love river cruises, and the Capiz River Cruise is one of the most beautiful ones I’ve had. The river is wide and long, and it’s super clean. What I love most about it is that there are still communities that live on the banks of the river, and lovely seeing the small nipa houses and the kids hanging out by the river bank. The cruise departs from the city center, and go all the way out to sea, where it makes a U-turn. There are two kinds of boat that you can take on the tour. The one we rode was a small native raft towed by a couple of banca. 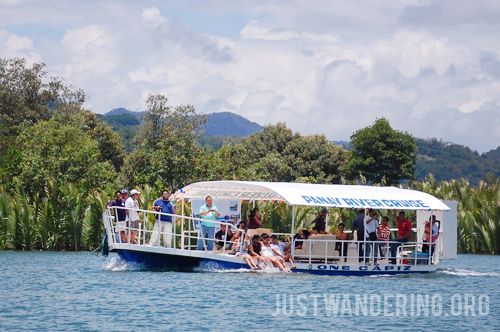 The cruise costs Php 1,500 for one raft, and it can accommodate up to 20 passengers. 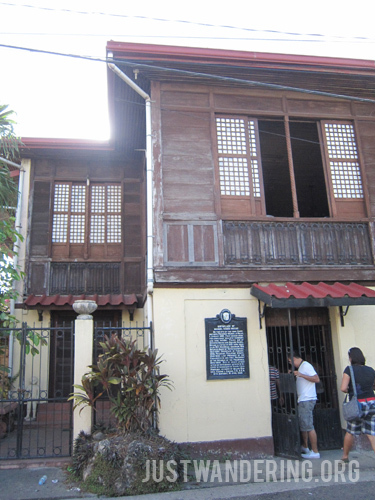 The Acuña ancestral house where President Manuel Roxas was born is still standing. A typical bahay na bato, it features a receiving area on the ground level, with the main living area on the second floor. There are some furnishings that have withstood the test of time, including a cool antique electric fan. A favorite place to pass the time, Baybay beach has a promenade on the shore where you can wait for the sun to set, snack on street food, feast on seafood, or people watch. The People’s Park has this cool lighted fountain, which turns on when the sun has gone down. One of the highlights of the Capiztahan, the Parade of Lights features dancers and bikers donning a multitude of accessories that light up. The most anticipated part of the parade are the floats of colorful flora and fauna that gets everyone raising their cameras for a photo. The event culminates with lights in the sky: a fireworks extravaganza that lasts for almost 20 minutes. We learned about the history and the culture of the people of Capiz in this small, but artifact-filled museum. 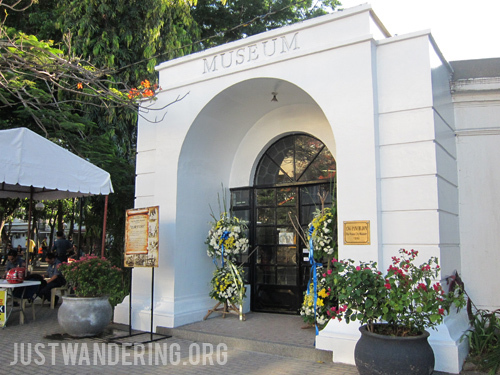 The main showcase of the museum of course, is the province’s most prominent citizen, President Roxas. 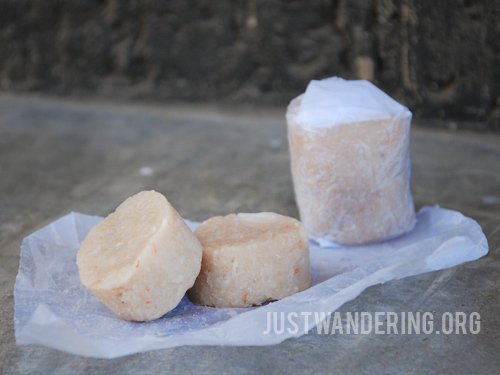 Baye-baye, a local kakanin made with pinipig, coconut, and sugar. This reminds me of hinagom, a delicacy from Bicol that my mother occasionally cooks. Our breakfast at the market set the tone for the entire weekend. In every meal, there was seafood, specifically shrimps and prawns, which we hardly get to indulge in when we are in Manila, since they’re quite expensive. Towards the end of the trip, I noticed we were eating less and less of it. 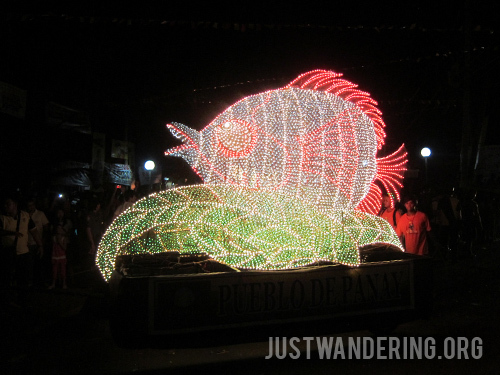 If you love seafood, there’s really no better place to eat them than in Roxas City. To read more about what we ate there, check out the article I wrote for Yahoo! 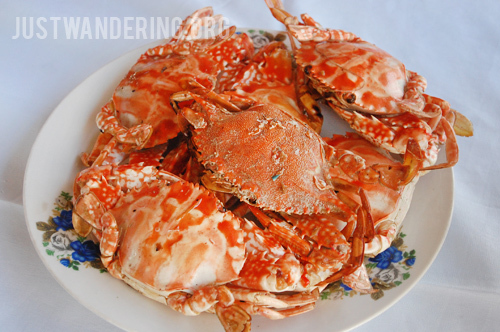 Philippines: Roxas city’s seafood diet. 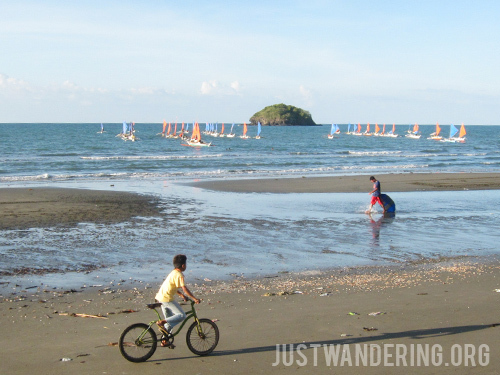 View all the photos from the Roxas City trip at the Just Wandering Facebook page. Thank you so much to Pueblo de Panay for this opportunity, as well as the Capiz Tourism office for touring us, and to Impressum for reaching out! Another famed seafood in Roxas is said to be the Angel-winged clam which is so expensive and hard to find in the metro. Sana there are more things to visit in Roxas City. The cruise was a good idea. When visiting the Roxas City, people should not be missed to visit the Baybay seafood grills located at Baybay beach. They served fresh and irresistible local cuisine that comes straight from the sea. Well, any trip to the city is never complete if you missed to taste their best-tasting seafood.